Todd and I arranged for every single posed picture to be taken before the ceremony started. We saw each other before the ceremony and took all of our wedding party and family photos before. We were really looking forward to leaving the ceremony and getting to the reception as soon as possible so we could party with our friends and family. We exited the chapel and the entire wedding party boarded a trolley. 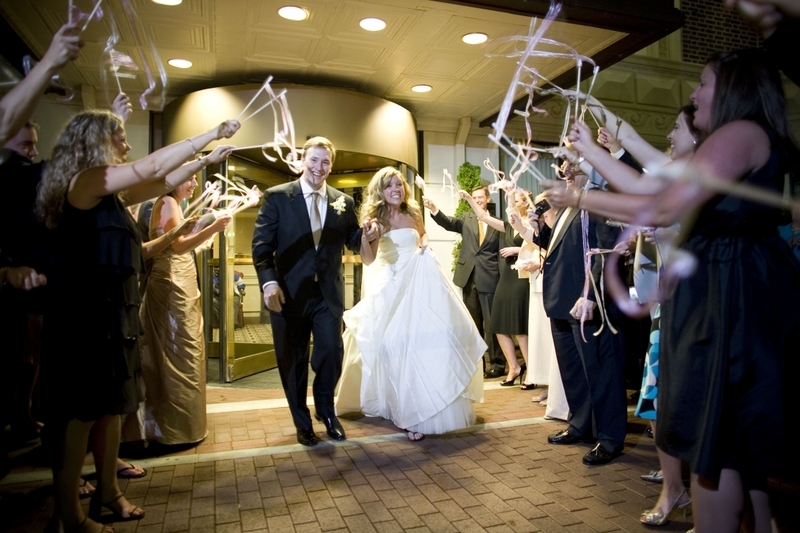 We waited about 20 minutes before we made our grand entrance to the ballroom and the dancing began! We had our first dance to “Can’t Help Falling in Love” and my dad and I danced to “Your Song” by Elton John. Our friend, Rick, played the music and sang to us and that was a really sweet moment. After he was finished, our fabulous band, The Root Doctors, took the stage and we never looked back! The night could not have been any more fun. 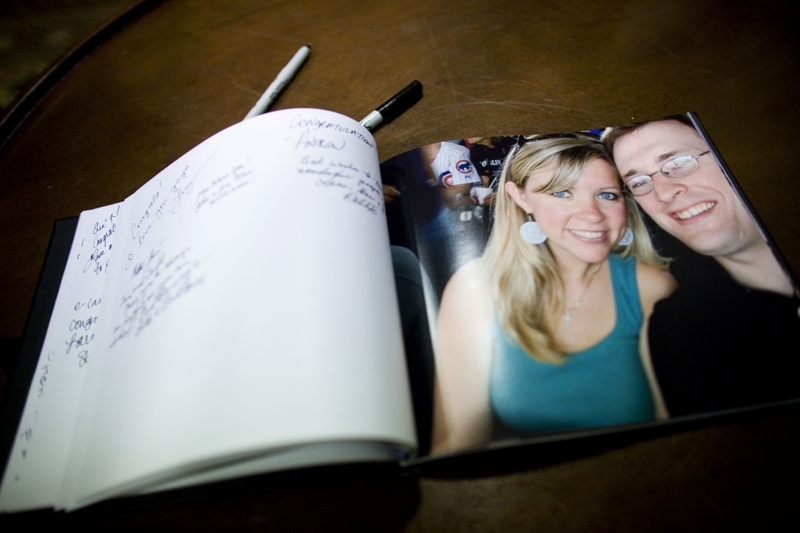 I used Kodakgallery.com to create our guest book. I ended up making a photo album of all pictures of Todd and me together. I’ve always wanted to take all of the pictures of us and put them into a book, but this gave the book a purpose. It was also a great way to show our guests some of our history as a couple; where we’ve been, what we like to do, etc. I left every other page in the book blank and the guests signed the blank pages. They told us they really loved looking at the informal and silly pictures of us. We had a Southern-style reception. We didn’t have a full meal served or even a full meal buffet. We had food stations of shrimp and grits (a lowcountry South Carolina dish), crawfish etouffee (for my Louisiana roots), pork tenderloin and sweet potato fries, and then a round buffet table of mushrooms, beef kabobs, and plenty of other bite size goodies to fill you up but allow you to keep on dancing and drinking. Our signature drink, the Carolina Crush, consisted of madeira wine, iced tea, lemonade, mint, and vodka. We made sure that it was pink, of course, and it turned out to be a hit. 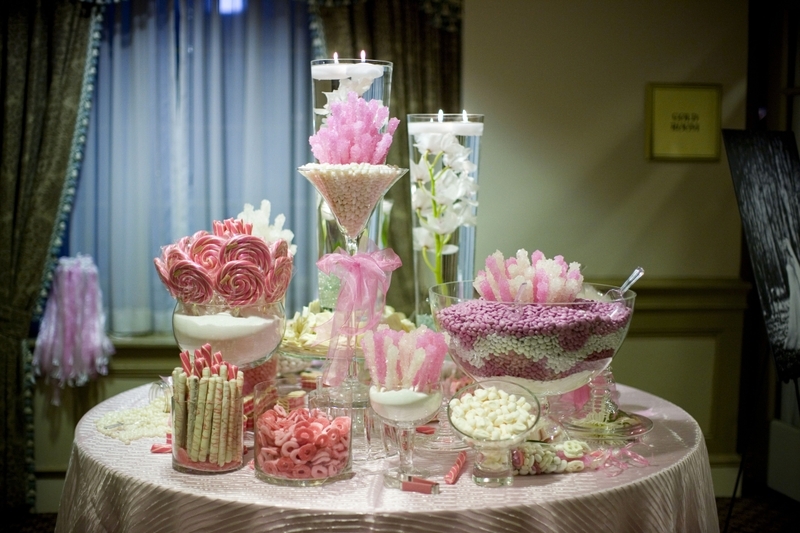 We also had a pink and white candy buffet instead of favors. My mom and I had so much fun picking out the pink and white candy. The pink lollipops and crystal rock candy on a stick were really beautiful! My mom and her friends did the set up the morning of the wedding and I have to say that it got more compliments than any of our other decor. She bought the orchids in the water from a wholesale florist and drove with them all the way from Dallas! Our band definitely made the reception. The dance floor was packed all night and that’s all I needed to know that the party was a success! 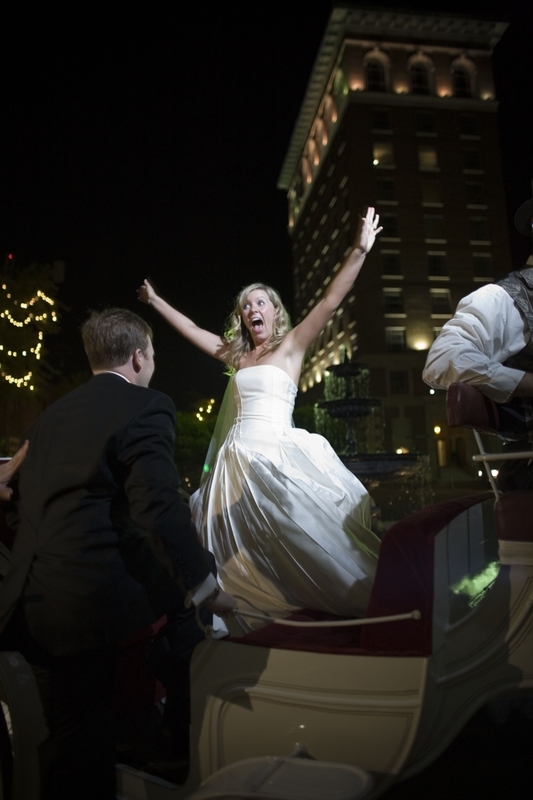 These are my absolute favorite reception photos. 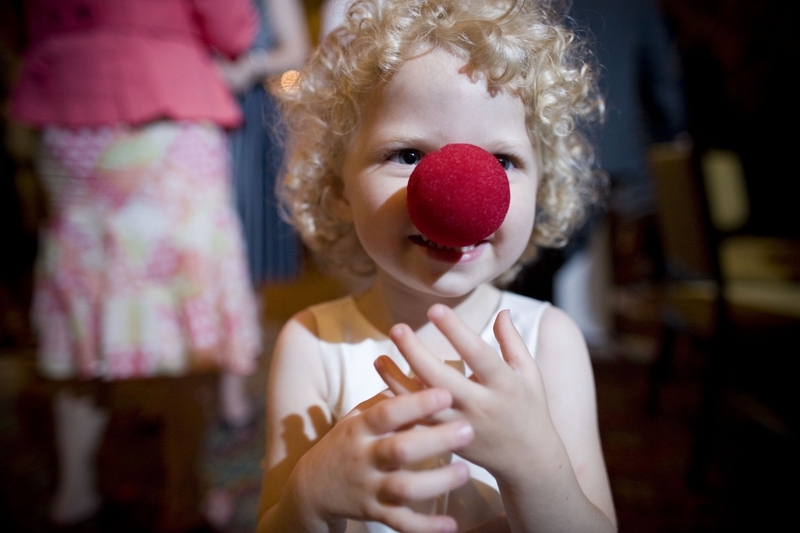 Bell ringer, Natalie, wearing the clown nose that my Dad brought from the children’s hospital he works for in Dallas. He pulled this out of his jacket pocket and had us laughing minutes before we walked down the aisle. He gave it to Natalie at the reception. 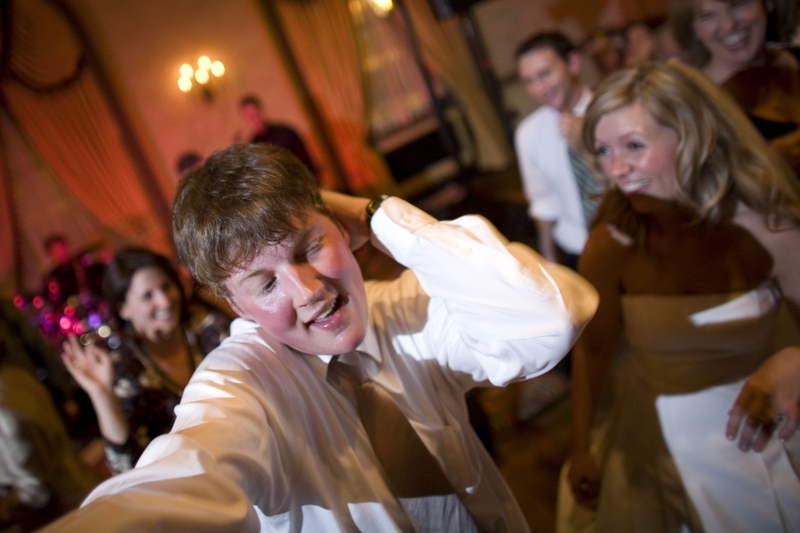 My college friend and wedding usher led the conga line. 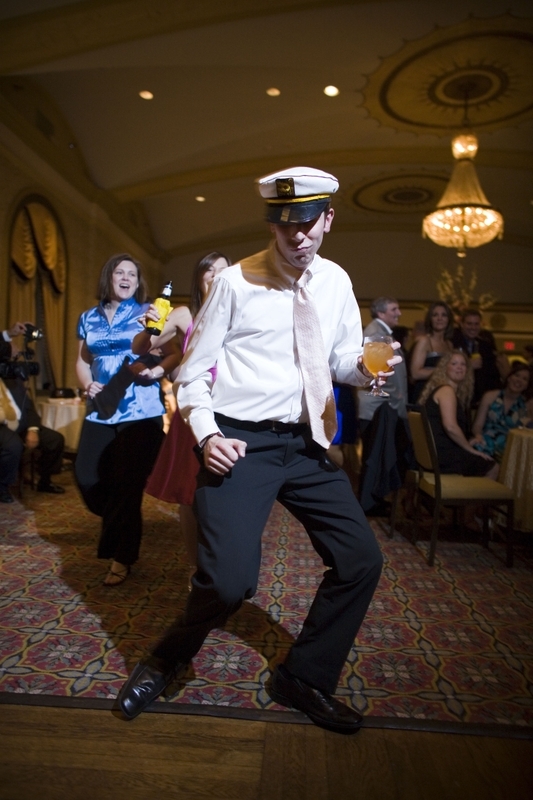 The captain’s hat was the party prop that got passed around the room that night. 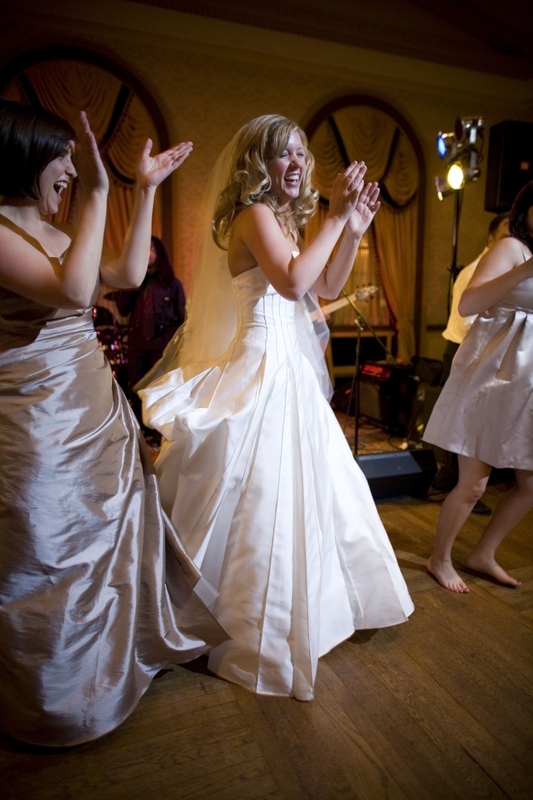 My bridesmaids and I did a line dance that we used to do during our sorority days. Our big exit with the wands that my coworker and I made. The final photo of the night. I was pretty excited!